A visit to Sidley Park is never for naught. 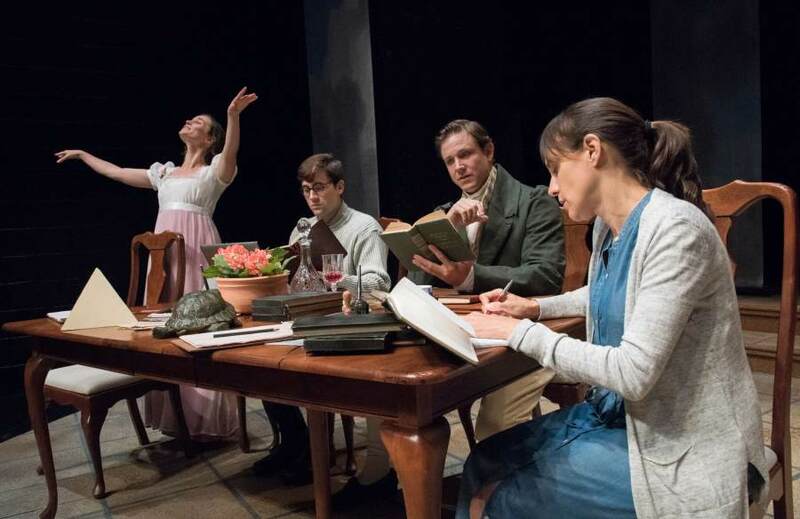 In Potomac Theatre Project (PTP/NYC)'s light-on-its feet production of Tom Stoppard's 1993 masterpiece, Arcadia, the play proves as timeless as ever; there's perhaps no greater testament to the work's themes. Split between the early 19th century and the turn of the millennium, Arcadia tracks the intrigues and discoveries of the residents and visitors of a country estate in Derbyshire. From 1809 to 1812, supervised by her tutor, Septimus Hodge (Andrew William Smith), the young Thomasina Coverly (a spritely Caitlin Duffy) advances a precocious--and anachronistic--theory of entropy derived from a cup of rice pudding. Meanwhile in the 20th century, professor of literature Bernard Nightingale (Alex Draper) spars with author Hannah Jarvis (Stephanie Janssen) over a possible new chapter in the life of Lord Byron. Through marginalia, mundane records of the house, and a good bit of recovered scratch paper, the truth of Hannah's subject, the hermit of Sidley Park, is revealed while the action of academics in both eras reveals the fundamental truth--how little people and their passions change. The parallels follow in Stoppard's suggested staging, maintained here, as items from each epoch collect on a large downstage table on Mark Evancho's simple, evocative set. Another nice bit of doubling is also accomplished by costume designer Mira Viekley, as Septimus exits in a green frock, cravat and beige trousers as Hannah enters in a complementary ensemble of a green cardigan, blouse and slacks. But while Stoppard shines as a technician in plotting what may be his most intricate work, his near erudite-to-a-fault script is far from bulletproof in the hands of lesser performers. Thankfully, once they warm up a bit, the company, directed by PTP/NYC co-founder Cheryl Faraone, have golden ears for Stoppardian wordplay and rhythms. Mr. Draper and Ms. Janssen are electric together as the feuding scholars, Mr. Smith as Septimus seems pulled from another time as he capably melts sealing wax, and Jackson Prince as the graduate student and contemporary child of the manor, Valentine Coverly, does as good a job as anyone could explaining chaos theory to me. As Septimus mused in the garden all those many years ago, all that was once known and lost to us will be known again at a later date. Like many comedies dense in jokes or dramas heavy in machinations, Arcadia benefits from repeat viewings (the women behind me had seen it four times!). If you've seen it before, you might be surprised what you find yourself learning (or re-learning) in another sitting. And if you're new to Sidley, PTP/NYC's production is worth your time.